Not everyone has a computer. Not everyone has email. This is where a post newsletter can come in handy. You can create a newsletter and post a copy on the internet, attach it to email for distribution, or you can mail it. The US Postal Service has special rates for mailing of 220 or more items..
myLegion.org Templates. We recommend that you download a template from national under myLegion.org. Adjutants should sign in and locate a template under Publish Newsletter. Select the instruction link and this will take you to Creating a Newsletter/Calendar. Take a look at each of the templates and use the one you like. You can select a one or two-column newsletter or make a post flyer. All have the official and authorized American Legion logo. They are easily edited with MS Word or one of the free open source suites (try LibreOffice.org). 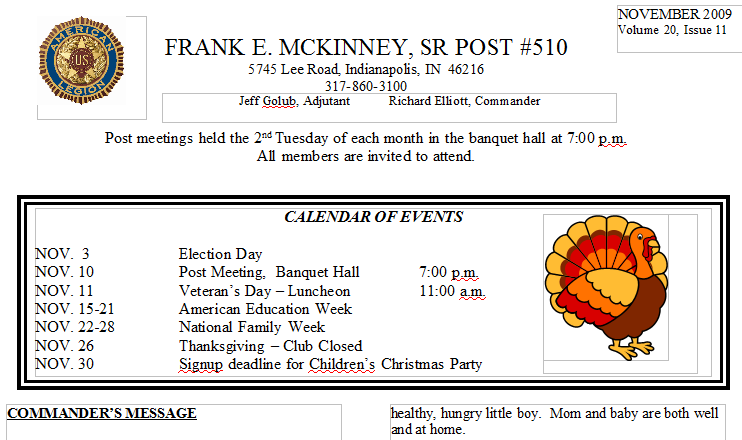 The sample here shows a two-column newsletter, header only. The text can be overwritten as you are downloading a copy to your computer. Save the edited copy as a template for future issues. Customize the header to include local information.